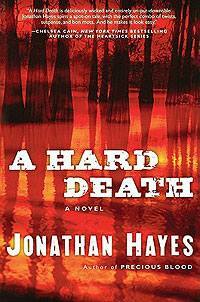 My friend Jonathan Hayes has a new book out called A Hard Death. Jonathan is a senior medical examiner at the Office of the Chief Medical Examiner, and you can read more about him here. Fascinating guy, really. A guy whose life is basically a thriller writes thrillers. Jenner, the brilliant forensic pathologist hero of Precious Blood, has survived the horrific final denouement of the Inquisitor serial killings, but not the political fall-out. His medical license suspended, Jenner finds himself banished from New York to Douglas County in coastal Florida, and settles in to work as a Medical Examiner in the balmy seaside resort of Port Fontaine. But nothing in Douglas is as it seems. First, Jenner’s former mentor is found savagely murdered, then an anonymous call in the middle of the night leads Jenner to a nightmarish discovery in the Everglades. He finds traces of a shadowy criminal conspiracy, and soon learns that he can trust no one.With his life on the line, Jenner refuses to walk away and let his friend’s murder go unpunished. The result is an explosive, edge-of-the-seat thriller in the tradition of Patricia Cornwell and Kathy Reichs.